In 2017, people of the Sheep zodiac sign will be blessed with good progress in their income, wealth and career. Even though minor threats for the Sheep are predicted, their overall position will be excellent and their desires will be fulfilled. They will be successful in all their ventures this year. Overall, the Chinese horoscope forecast for 2017 for the Sheep predicts happiness and prosperity in all areas of life. 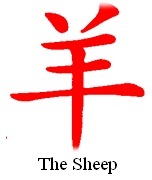 People born in the Sheep (Ram) or Goat year of the Chinese zodiac tend to be creative and have an artistic bend of mind. According to Chinese astrology people of the Goat sign are hard workers and are perseverant till they achieve their goal. Sheep people are caring by nature and try their best not to hurt anyone by their actions. They are extremely shy and think a lot before they start any new project. People of the Sheep animal sign are well mannered and have a pleasing personality. Security is of primary importance to them. Robert De Niro was born in the Year of the Sheep. People in salaried jobs and business will scale new heights in 2017. But this does not mean that you start taking things for granted and become careless. Relationships with colleagues will improve. Income and finance will be strong this year. Expenses will also be high. Try to control your spending. The Chinese love horoscope predicts that in 2017 Sheep people will need to be careful in their relationships. New love affairs may not fare well. Married people may experience a lot of arguments. Chinese astrology predicts that health in 2017 needs a little bit of looking after. Do not take too much stress as this may affect you adversely. Take part in sports and physical exercise to increase your vitality. Try to spend quality time with parents, spouse, children and friends. Close family members may suffer from ill health.